Unemployment rates in Maryland are close to the state’s all-time low but continue to rise despite the state adding new jobs. Although the unemployment rate in Baltimore and Maryland are close to the lowest reported values (5% in 2007) and the state’s unemployment rate is below the national average, people are worried that the state is headed into an employment crisis, because April 2018 has been the sixth time in a row that the state recorded an increase in unemployment rates. According to the US Federal Reserve, the unemployment rate in Baltimore City reached 5.8% in April, after earlier this year the state lost 20,200 jobs. The loss was reported in all fields, but business services were the most affected, as almost 6,000 professionals were laid off. Next up was the hospitality sector, which lost almost 3,000 jobs. 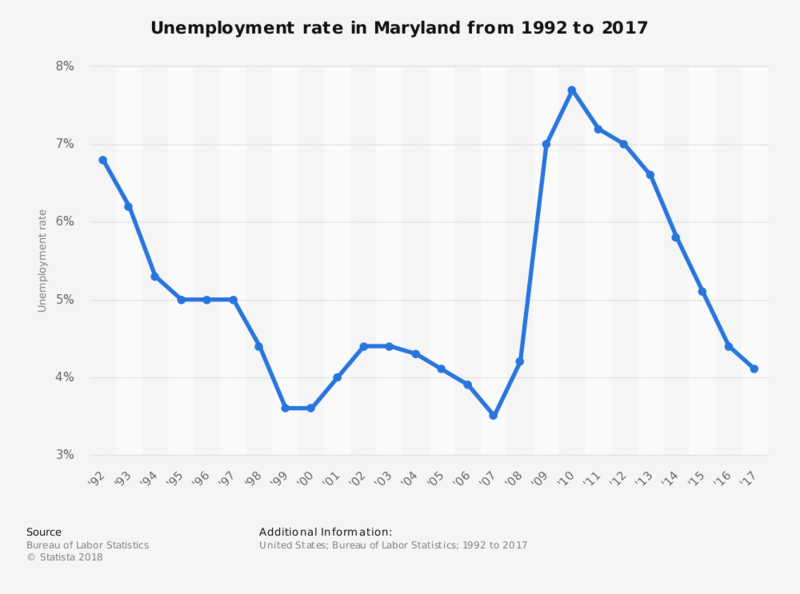 In March 2018, Maryland’s unemployment rate was at 4.3%, slightly higher than the national average, after it had reached a record low of 3.8% in October 2017. According to Darius Irani, chief economist at Towson University’s Regional Economic Studies Institute, job losses are considerable and they can be attributed to the low federal budget. Nevertheless, he continues, the losses are being revised and it is still early to tell exactly what causes them. Compared to 2017, the workforce market as a whole has been showing signs of progress and Maryland currently has one of the lowest unemployment rates in the United States. Early this year, Maryland had 10,800 more jobs than the previous year, a number surpassed only by Texas and Utah. In March 2018, thousands of jobs were created in Maryland. The transport and utilities sectors alone made available 1,400 jobs, while the constructions and hospitality sectors also created a combined 1,400 jobs. The public sector reported the lowest job creation rate, with only 100 new jobs. One area where the state’s employment seems to be making clear progress is black employment rate, which has dropped considerably and is now at the lowest level since 1972. Maryland also ranks no.1 in the U.S. for minority and women businesses ownership, making it one of the nation’s startup business hubs, with a forward-thinking corporate culture. The current state of Maryland’s workforce, however, is conflicting to many. People complain that the feds are sending mixed economic messages and that they are uncertain of the future of their economy. At a national level, the United States has an unemployment rate of 3.9% and stable job growth has been reported. Also, because there is no spike in wages, experts are not concerned about future inflation. However, some warn that the national unemployment rate drop should be taken with a grain of salt and that it’s not exactly a good sign, because most of it is due to a shrinking workforce. On the one hand, America’s aging population approaches retirement and job seeking is no longer one of their priorities. On the other hand, a background search for the average American company reveals that it is unable to compensate its employees properly and, as a result, many workers actually have to look for multiple jobs to sustain themselves and their families. The scales are balanced by Baltimore’s dynamic start-up scene, which welcomes innovation, especially in tech and biosciences. Thanks to a large number of government agencies in the area, there is an increasing demand for cybersecurity and IT experts and IT employment is at an all-time high. 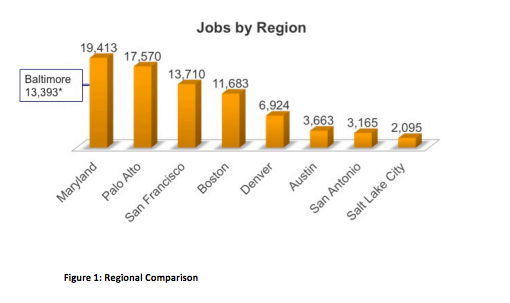 In fact, IT employment concentration in the Baltimore-Washington areas are even higher than in Silicon Valley. Six years ago, Baltimore was featured by Forbes in a top of the best cities for technology jobs and the area remains an IT hub to this day, thanks to the award-winning colleges and universities here. According to a recent report from the Maryland Democratic Party, the state is experiencing slow job growth compared to the neighboring state of Virginia and that the reported economic success is seen differently by the average Maryland citizen, who now earns less per hour compared to a couple of years ago. According to the US Bureau of Labor Statistics, the highest paying jobs in Baltimore are in Obstetrics & Gynecology, Pediatric Medicine and Internal Medicine, while dining room attendants, fast food cooks and parking lot attendants have the lowest salaries.